The Fantastic Adventures of Guoan the Great, bringing bit.CNY to the masses. Some of you might remember my friend Guoan in Weihai City China, for whom I bought a beer using bit.CNY, well he is on a mission to bring bit.CNY to 100 brick and mortar stores across China. And I am happy to report that it is going incredibly well. Last count, as of Friday November 2nd, he was at 81 stores. That is 81 stores which are now accepting bit.CNY as payment. Let that sink in for a minute folks. Imagine going into a coffee shop and buying coffee with BTS, or lumber from your local hardware store with bit.EUR. How about buying a car with bit.USD? It's the dream for all of us, isn't it? freedom from banks and third parties. Well thanks to Guoan, this is already happening in China. His mission, as stated here which I am trying to summarize (please forgive the poor translation ) is "to promote the bitshares community ... [and once] all the parts of the country are filled with offline exchange locations, the 100-city stores will be broadcast live regularly to expand the influence of the BTS community. The BitShares community will be the largest open source community in the blockchain. " 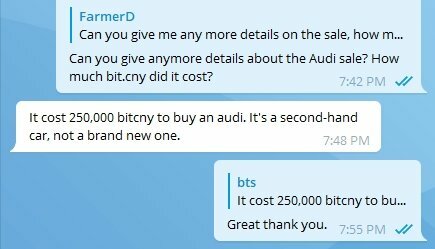 Already, thanks to his work, BTS and bit.CNY can be used to pay for the purchase of cars (yes that's right folks cars! and we're not talking beaters, think high end... think, ... I'll get to that in a minute😉 ), computers, catering, fruits, handicrafts and life services. He has also set up the BTS Baicheng Baidian Business School which will help to link all business who are accepting BTS and bit.CNY as payment. In this school they will "learn a business knowledge topic every day and discuss it together. Provide posters and other promotional designs for joining the merchants. Provide business analysis and event planning for the business. The community does not charge any fees." He hopes "that everyone will actively cooperate and enhance their respective brand, operation and sales capabilities. It also provides a good offline community communication environment for BTS users." BTS is also being used to reward customers. "Offline shop owners use ... BTS to reward consumers (for example), consumers come to the store to consume, the owner ... sends BTS blockchain dividends to consumers ... curious people will accept that if hundreds of shops take the same activities." But the thing I am most excited about this is. This is just a short update on Guoan's activities. More to come folks especially when his 100 store goal is reached.